The kids and I have started a little vegetable and fruit garden. We planted tomatoes, peppers, onions, strawberries, blueberries, cucumbers, watermelon, squash, basil, and cilantro. I told the kids they’d have to help me remember to water the plants. Otherwise, they would all die like they have every year we have tried to grow anything. I’m trying extra hard not to let them die. So, this morning before I took the kids to school, I went out to water my plants. I consider them sort of like pets, or babies, if you will. If they yield a crop this year I will be so so so thrilled! After watering them, I looked over at my roses. Those are pretty easy to keep, so much that I sometimes forget all about them. Today, however, what I saw took my breath away. My red rose bush was beautiful! It was full of bright red roses, calling me to bring them inside. Their scent filled the air around the bush. It was amazing. 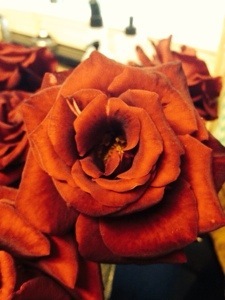 Here’s the thing about red roses. Red roses will always remind me of my mother-in-law, Cindy. You see, we had the most beautiful red roses for our wedding day, and it was all thanks to Cindy. The roses filled my bouquet, table centerpieces, and decorations throughout the church and reception. They were everywhere! Every arrangement had either been made my her or been approved by her after careful inspection. She wanted all the roses to be perfect. AND they were! They were absolutely beautiful! I couldn’t have loved them more. Cindy was an amazing lady. She was kind and generous. Her bright blue eyes lit up when she flashed one of her big smiles. Despite being right around five feet tall, her small frame did not define her. She was unstoppable. She was strong. I’ve never seen a lady do the amount of hard labor that Cindy did around the farm with the ease and grace that she did. I’ve described her as a little feisty sometimes, in the most loving way, of course. My favorite side of her was her loving and nurturing side. She was a soft and gentle mother to Ian. She was proud of his accomplishments and always encouraged him to be the best he could be. I thank her for giving Ian the strong foundation and self esteem that he has today. The love she poured into him lives on in Ian’s life everyday. She was an amazing mother-in-law to me. She took me right in as one of her own immediately, and started pouring that same love on me. 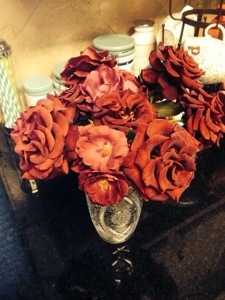 I’m grateful for the reminder of Cindy by these beautiful red roses. Thank you, God, for this gentle reminder of her today. « What I learned from a homeless man and my kids.